Eye-catching orange and chocolate tones highlight a bouquet of copper beech, black elderberry, ranunculus, sweet peas, grasses, mallow, nine bark, bronze fennel and snowberry foliage. 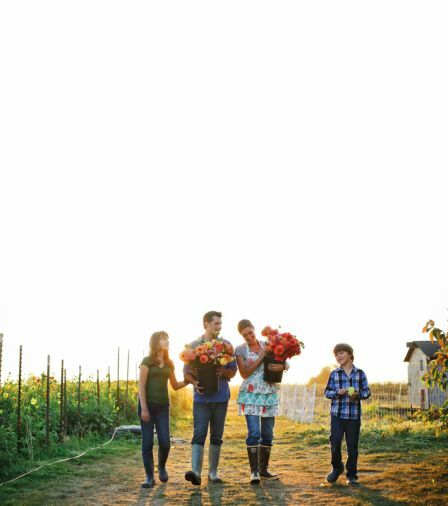 Since 2007, Erin Benzakein and her husband Chris Benzakein, along with her daughter Elora and son Jasper, have tended to flowers on Floret Flower Farm, a 2-acre certified organic flower farm in Washington’s Skagit Valley. 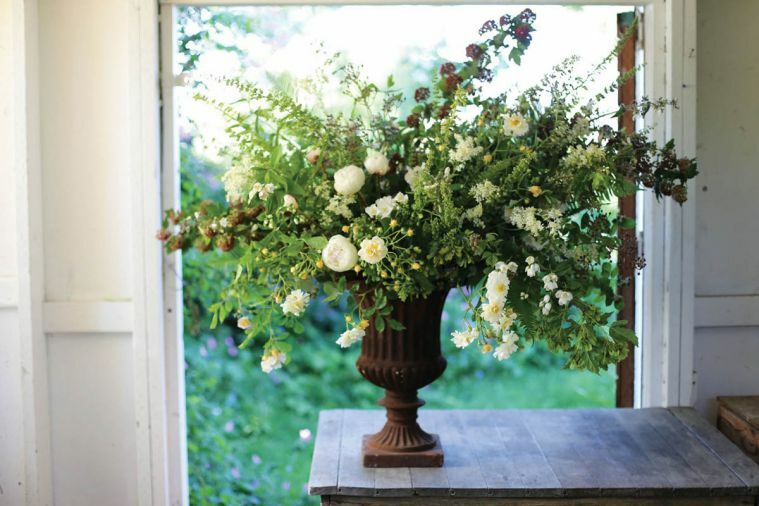 Spring on the Farm: An early season arrangement of dock, ninebark, bush honeysuckle, heirloom rambling roses, peonies, filipendula, penstemon, amur maple pods and mock orange. Sunshine & Rain: Spring flowers are particularly welcome in the Northwest, following those sometimes gray days of winter. 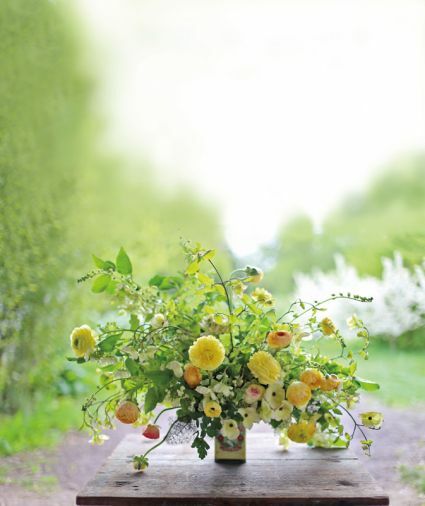 This cheerful April arrangement incorporates dogwood, viburnum, bronze fennel, thalictrum foliage, ferns, and the ever-showy yellow ranunculus. 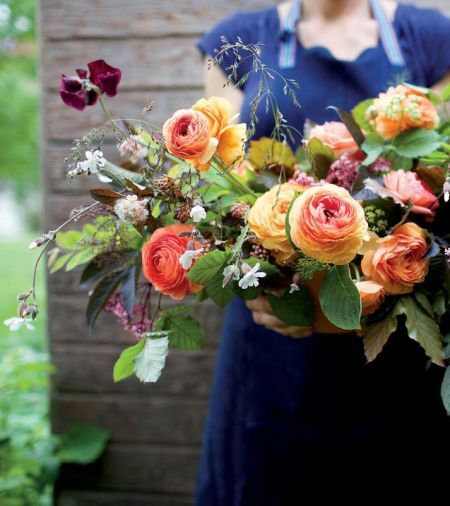 Erin Benzakein artfully produces five acres worth of flowers on her family’s tiny two acre plot. 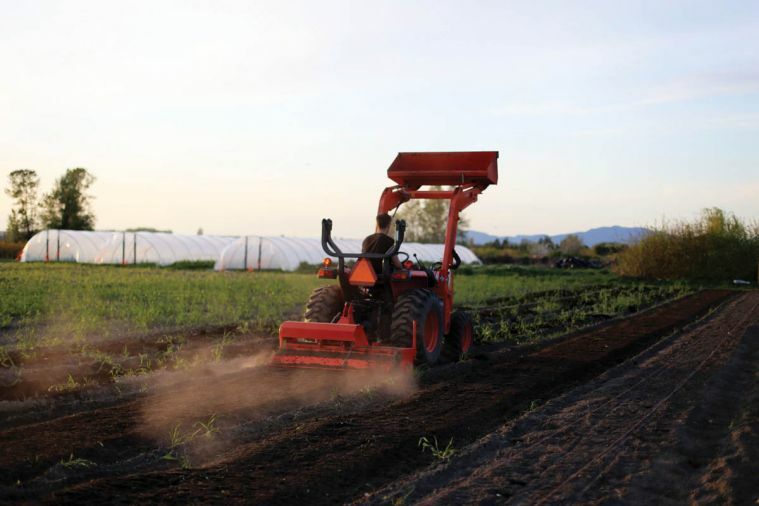 Erin’s entire family is involved in planting, tending and harvesting. With the commute to work but a few short steps from her front door each day, there is plenty of time for family. 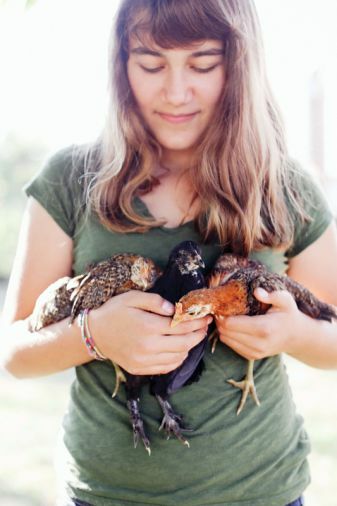 No farm is complete without chickens. 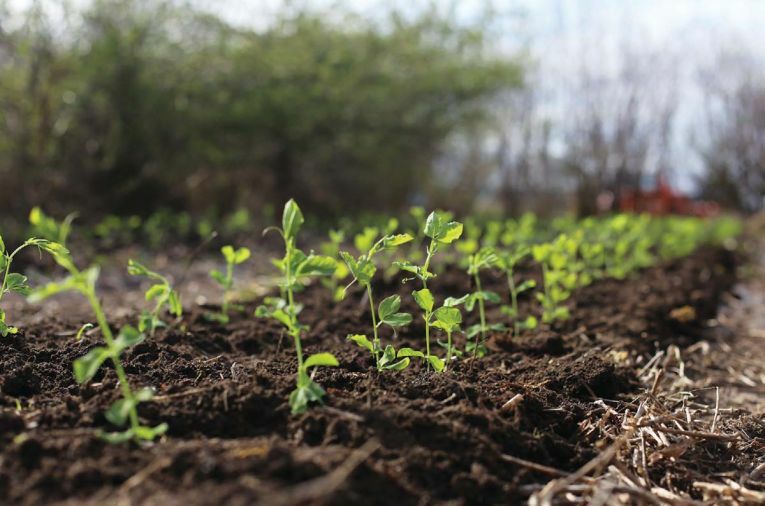 Tending the fields: Erin’s entire family is involved in planting, tending and harvesting. Garden of Eden: Edibles can add spice, texture and pops of unexpected color to arrangements. 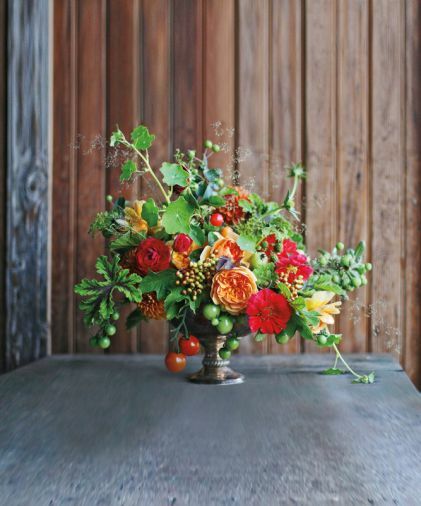 Shown is a mixture of scented geraniums, viburnum berries, nasturtiums, tomatoes, garden roses, baby apples, berries, crabapples, and grasses. 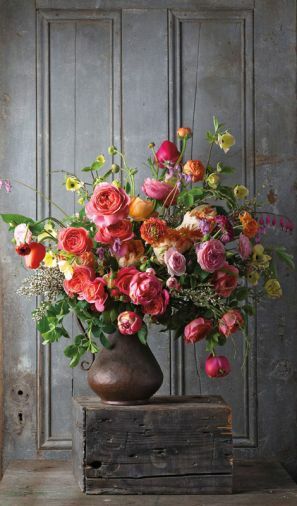 Going Dutch: Finding inspiration in Flemish floral still lifes, a wild and romantic bouquet of garden roses, dogwood, ranunculus, tulips, bleeding hearts and hellebores. When I call Erin Benzakein around 8am on a weekday morning, she answers her phone already knee-deep in her organic flower fields. I imagine she’s surrounded by fragrant sweet peas, exotic poppies, and elegant garden roses. “Let me tromp back to the house,” she says, and she sounds like she’s smiling. 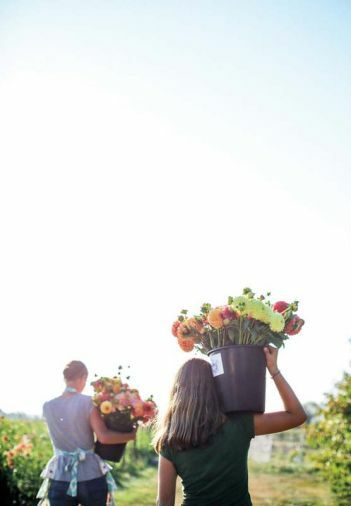 She’s already seen the sunrise; a perk of morning harvest for her signature, ethereal bouquets. 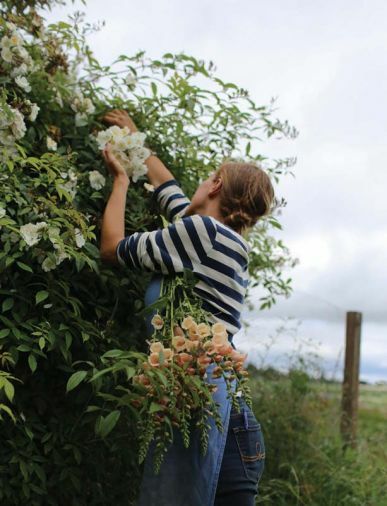 Since 2007, Benzakein and her husband Chris Benzakein, along with her daughter Elora and son Jasper, have tended to flowers on Floret Flower Farm, a 2-acre certified organic flower farm in Washington’s Skagit Valley. 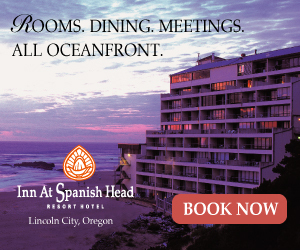 Portrait: What was the inspiration for your business? 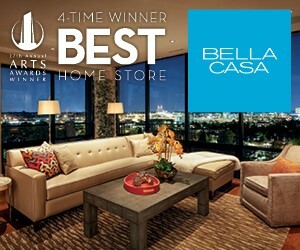 Erin: I started out as a landscape designer. That’s actually how I got into growing. And then I had grown this patch of sweet peas in my garden. There’s a whole story about it on my website. It’s called “Sweet peas were the gateway.” And then from there, I just planted more flowers and more flowers and more flowers. And then this business was born. Portrait: Tell us a little bit about your farm? Erin: We have a tiny…I like to call it a micro-farm. We’re farming just about two acres. That’s it. We use all these different strategies for getting tons of stuff out of a small space. 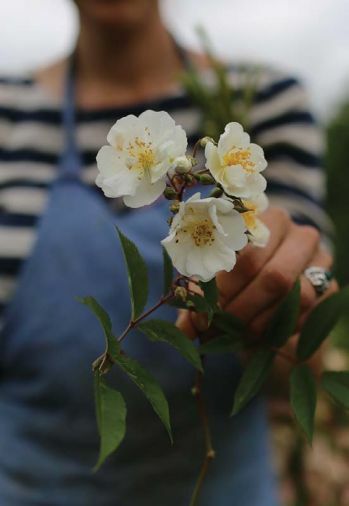 Portrait: How many different varieties of flowers do you have growing? Erin: Last year I started from seed, just seed alone, 260 varieties. It’s a really wide range we grow. And that’s not counting the shrubs and trees or perennials. 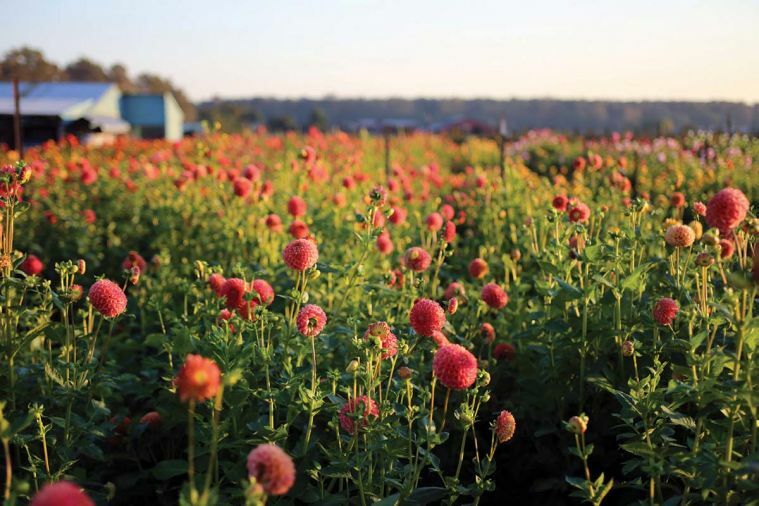 We produce five acres worth of flowers on just two. Portrait: When you think of your inspiration, was there anything in your childhood or as you were growing up? Erin: My great-grandma. When I was little I used to spend summers at her place. She would always send me out into the garden with scissors. It was my job to make a little bouquet for her bedside table. So I’d go tromp around her garden – she was actually kind of bedridden, and I’d bring the garden in to her. That was one of my favorite things to do every summer. Portrait: That’s so sweet. 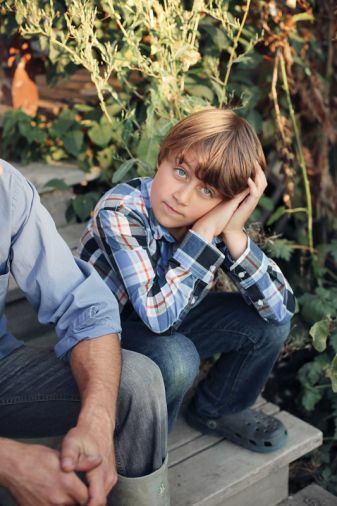 How has it been raising your family on the two acre farm? Erin: It’s been wonderful. The reason really for starting the business was so I could stay home while the kids were growing up, but also do something that I loved. So it’s made a really beautiful lifestyle. The kids can come and go from the house. The gardens surround us. It’s pretty magical. Portrait: Do you have any favorite farm memories? Erin: Probably just the kids growing up in the garden. As I’m working in the greenhouses, they’re out there playing with the hose in the yard. The flowers and family and the business kind of all blend into each other, back and forth. It’s really a beautiful life. Portrait: Do you have a favorite aspect of the designing or the growing? Erin: Planning is by far my favorite. I spend a good deal of time every winter strategizing on how I can fit so many varieties in a tiny space. And I’m really into trialing. Every year I put on a handful of trials. So last year I grew over sixty varieties of celosia. The common name is coxcomb. And then this year I’m doing twenty-two varieties for ornamental kale and a dozen different feverfews. 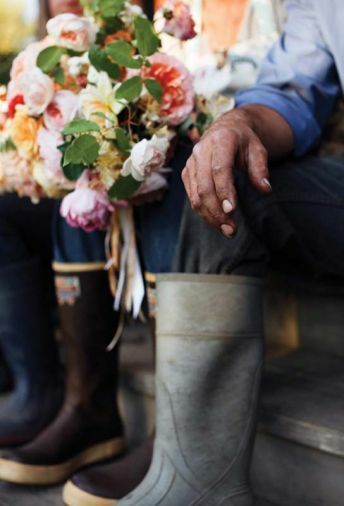 Portrait: What have been some of the challenges you’ve encountered with flower farming? Erin: Well, everything has to be perfect. So to get the flowers, to keep them really, really healthy and in the perfect state, it’s definitely a challenge. It’s not like vegetables where you can have few blemishes. Flowers have to be absolutely perfect. And the weather in Washington State is pretty rainy. We’ve ended up building ten different green houses to protect the flowers in the spring to try to really aim for that, the perfect stems without using any chemicals. Portrait: Is the flower industry pretty green? Erin: It’s one of the last frontiers to green up. That’s part of my mission, figuring out how to grow things really abundantly, get amazing harvest, perfect flowers without using chemicals and then sharing how we did that. It’s taking root all over the United States and all over the world. 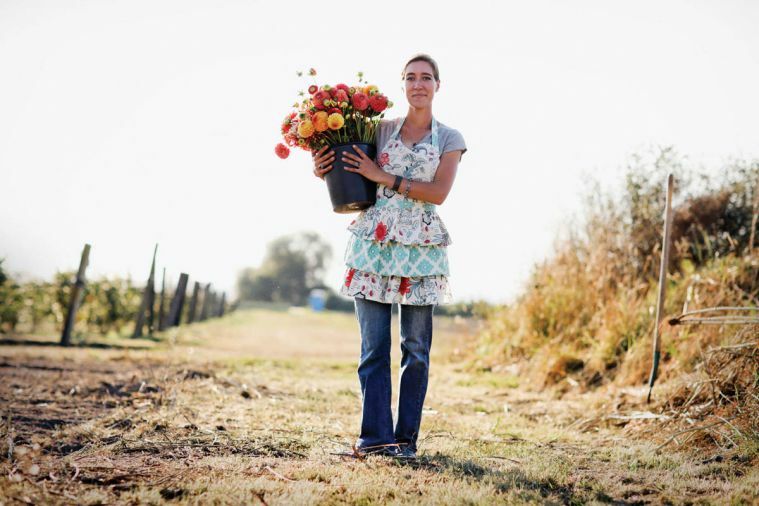 Portrait: How do you describe the term ‘the flower farmer’? Erin: I guess what I’m sharing would be sustainable growing practices, for flower growers so they can be kind to the Earth and also produce a really magnificent crop. 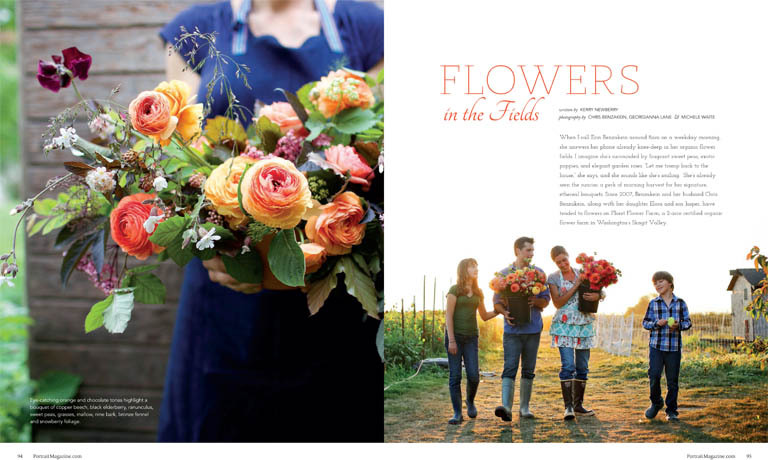 And then kind of the thing we’re working on right now is the farmer florist. That’s our name that we’re using, it’s people who want to do both. 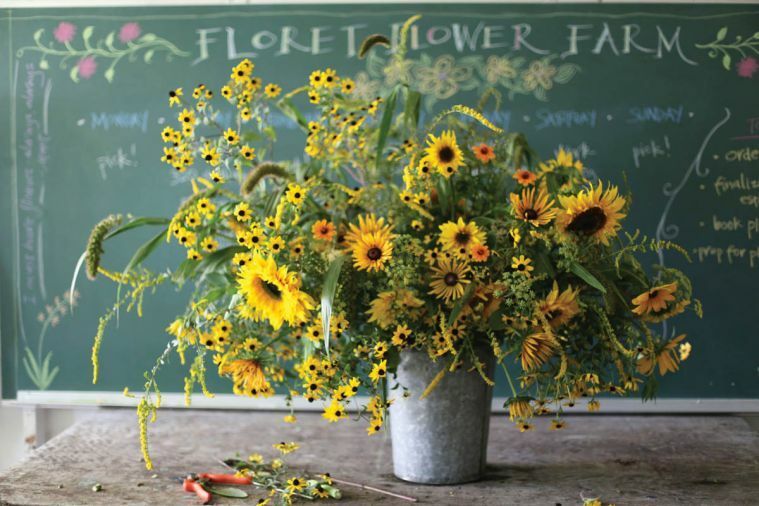 They don’t want to just grow flowers or just arrange them – they want to do some of both. We’re training the new wave of farmer florists. 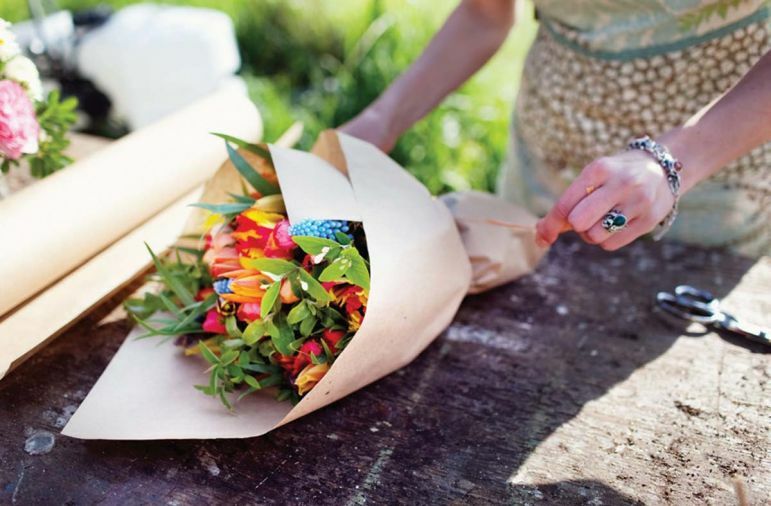 Portrait: Do you have certain flowers or crops that you absolutely love? Erin: I’d say dahlias. Dahlias are our most spectacular looking crop. We have four thousand in the ground this year. Erin: I know. And that’s maybe a third of an acre. I mean, we pack it in. It’s incredible. And then sweet peas are definitely up there too. Those are probably my two favorite crops. Portrait: I can’t imagine what all those dahlias must look like. Erin: They’re up to our shoulders, and then the light twinkling behind them, it’s so beautiful. I plant them in a rainbow order, just for photos. It’s so cool. Portrait: That is awesome. I love it. Any new varieties you’re excited to grow this season, to try out? Erin: Well, I know it’s dorky, but I’m doing that ornamental kale trial. They’re like little flowering cabbages and kales. They actually look like roses. They will be ripe around the holidays, so they’ll go into Thanksgiving arrangements. Then we’re also growing a lot of grasses and textural elements and pods. Some really funky stuff. We’re always stretching the limits of what’s possible. I also use lots of edibles in bouquets. Portrait: What kind of edibles? Erin: Tons of herbs at the base for arrangements. And then lots of unripe berries on the stem, little apples. I love green beans in bouquets, pea pods, little cherry tomatoes, that kind of thing. I try to put edibles in every single arrangement. Erin: When my friends are on vacation, I raid their yard. We also go up to the forest and cut on old logging roads. I’m always scouting for new things or wild things along the side of the road or along the train tracks. Portrait: So you must see things completely differently than other people. Erin: Absolutely. Even the Costco parking lot has great rosehips. The kids are like, Mom, stop it. Portrait: Do you have any new ventures on the horizon? Erin: I have a book in the works. We’re also working on an eCourse. It’s basically our workshops, but then packaged so people all over the world who can’t fly in to take one in-person, can still access all the same information. It’s going to be loaded with the videos and lots of tutorials. It will be like they’re here on the farm with us. Portrait: The workshops look amazing. 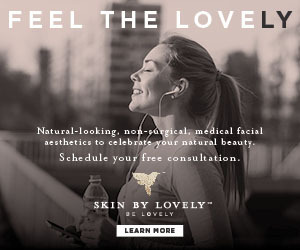 When people come out for those, is it often people that are interested in going into the business in some way? Erin: Definitely. This year we had people fly in from Thailand, Brazil, the UK. People come from all over the world to our tiny little farm. But what they’re really coming for is to see behind-the-scenes, how we get so many flowers from a small space. Because most people don’t have access to a lot of land. So we’re really thinking outside the box. And I’d say it’s an even split of people who want to be flower farmers and then designers who want to grow their own material to supplement their design business.